The NZDUSD makes another break. Trades to new lows. 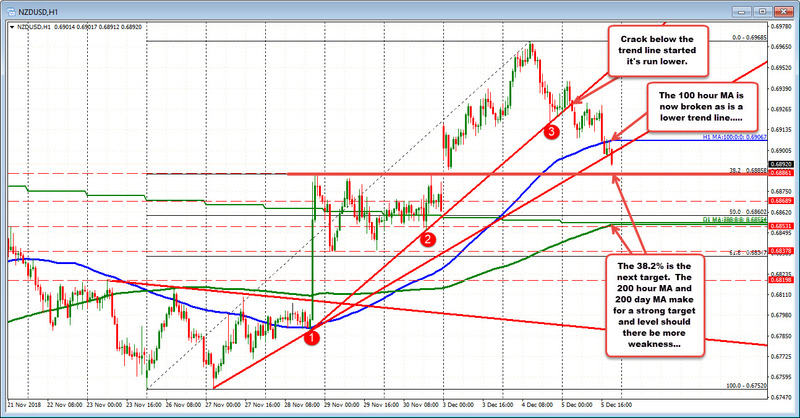 The NZDUSD has been taking measured steps lower today. First, the price fell below a trend line early in the session. Next the 100 hour MA was broken and more recently, a lower trend line has been busted. Bearish steps. The 100 hour MA is now a risk level for shorts. Stay below, keeps the sellers more in control. On more downside, the 38.2% and highs from November 28 and November 30th are the next targets at 0.6885. Below that - and looking forward - the 200 hour MA and 200 day MA are right around the 50% at the 0.66855-60 area. On more weakness going forward, those levels will be eyed.